Yesterday, I posted the traditional spinach molagootal with the coconut masala. Coconut adds a unique flavor, and there is no doubt about it. But for some reason, if you want to avoid coconut or if you are looking for kootu recipes without coconut then you are in the right place. We all love chow-chow, and it is vaandu’s favorite vegetable and needless to say that this is his favorite kootu too. I am skipping the coconut but not the coconut oil. I like to temper my kootu with coconut oil but you can use any neutral oil. 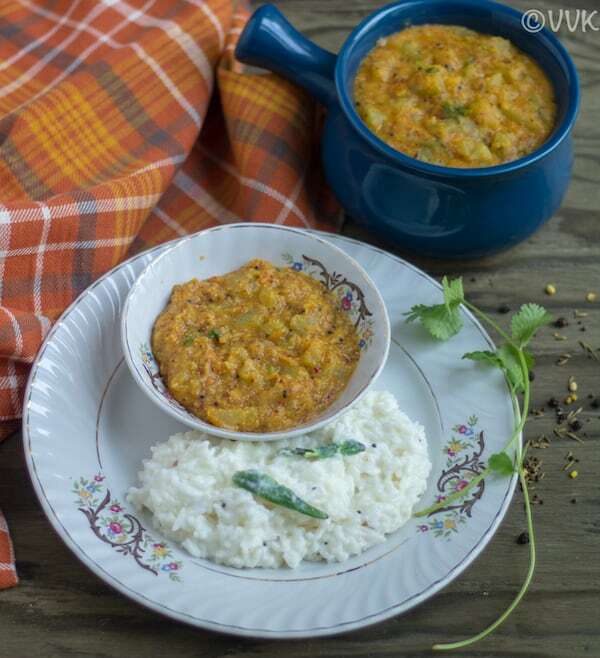 I replaced coconut with poppy seeds and roasted gram dal (pottukadalai). 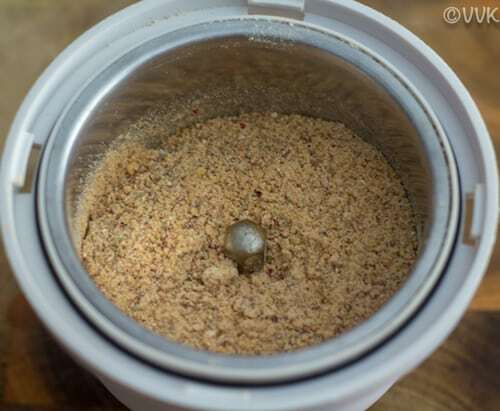 You can make this kootu powder well-ahead, and when needed you can add it to the cooked vegetable and the dal to make this kootu in no time. Perfect for the weekday meals right? I am yet to try making this kootu powder in bulk. I will soon share the recipe with the accurate measures. 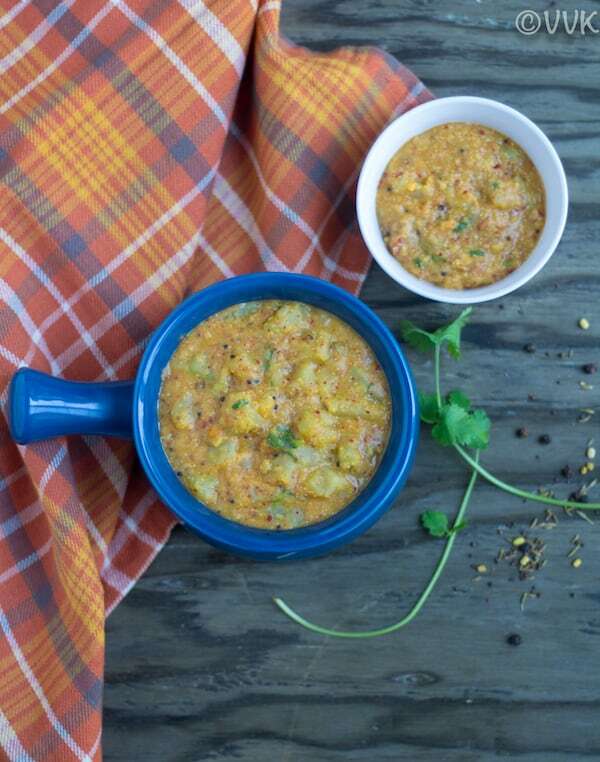 Why Pot in Pot method and Why can’t we cook the dal and vegetable together? I can hear your question. 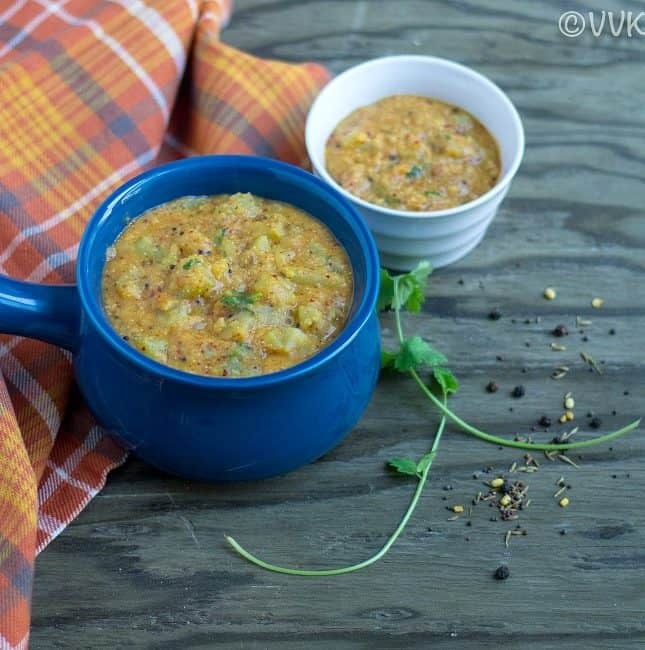 When kootu is just the combination of dal and vegetable why can’t we combine and cook it together? It is just a personal preference. Also, I wanted to share the PIP method. 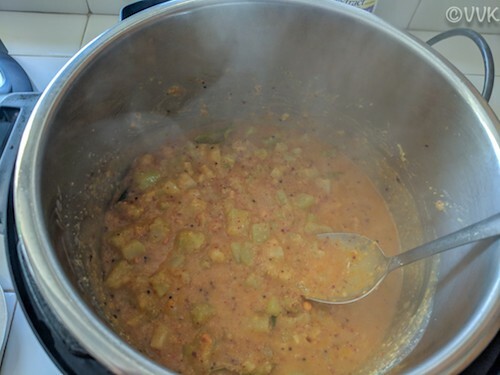 (More coming next year) I prefer mashed moong dal for the kootu, but I want my vegetables to be soft and tender but not mushy especially chayote squash. When I combine and cook, sometimes I end up mashing the veggies too. So I tried this way, and it worked out great. 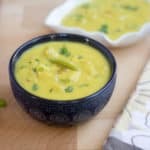 Also, if I cook the dal separately I use it for other recipes as well as for dal tadka or on festive days I use for the moong dal kheer. It is convenient when you want to cook multiple things at the same time. 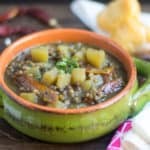 How to make this a one-pot kootu? I have one more Instant Pot kootu recipe coming up tomorrow in a one-pot fashion. But let me share the steps for this kootu if you don’t want to follow the PIP method. Using the saute functionality, temper first. Then add the vegetables, dal and ground masala. Add sufficient water and pressure cook for five minutes and release the pressure after five minutes or adjust the cooking time according to your texture preference. 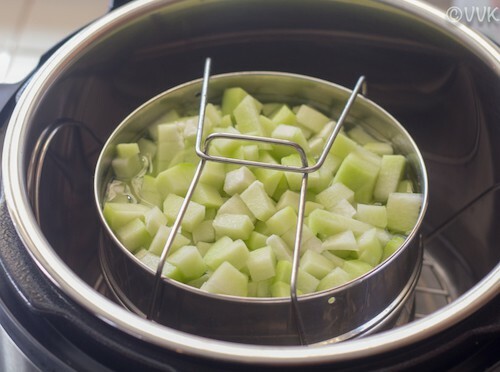 Wash and peel the chayote squash and chop into small cubes. Wash the moong dal as well. Grind the poppy seeds, roasted gram dal, red chilies, and cumin seeds without adding any water and set aside. 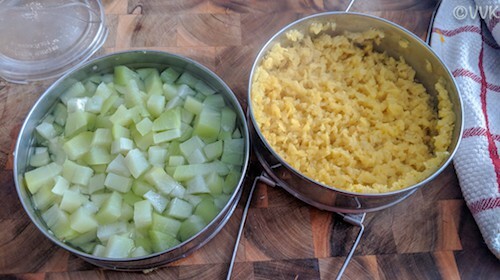 I used my two stacking pan set for cooking the chayote squash and moong dal. Here are the detailed pictures. 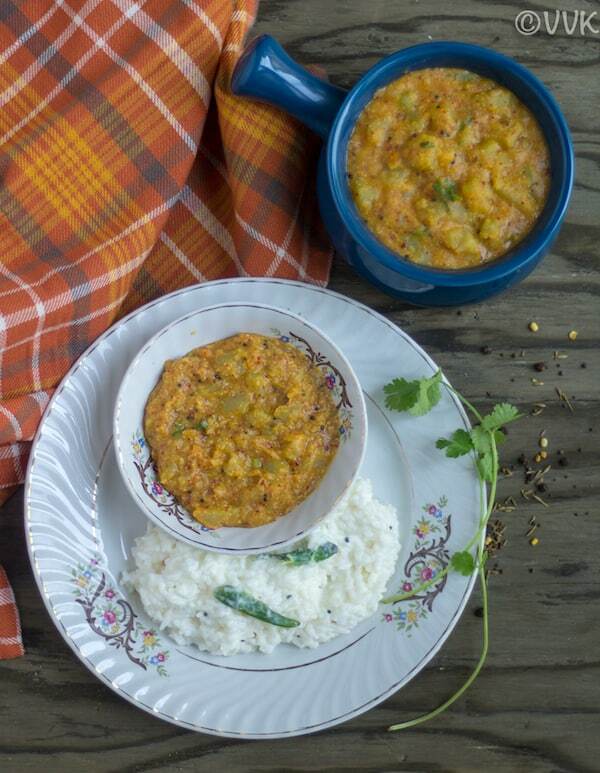 Place the moong dal in one of the stackable pans and add 3/4 cup of water and the turmeric powder. Gently mix it. 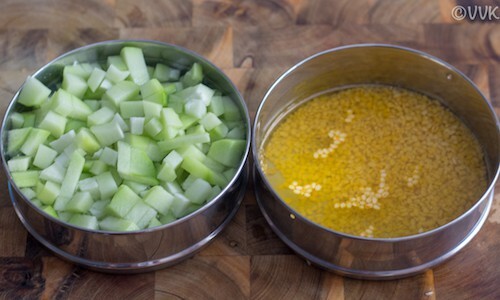 In the other pan, add the chopped chayote and 1 cup of water. Arrange the stacking pans and close the lid. Mine doesn’t have a lid. Now add 1 cup of water to the inner pot of the Instant Pot and place the trivet. On top of the trivet, place the stackable pan set with dal and the veggie. Press the manual/pressure cook mode and cook for five minutes at high pressure and release the pressure quickly after 5 minutes. When the pressure is all release, carefully open the lid and remove the stackable pans. 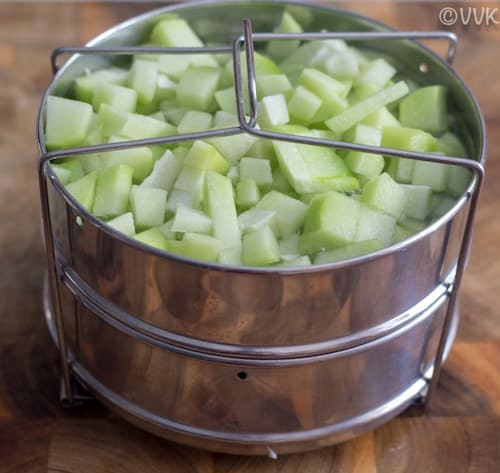 Do not discard the water from the chayote squash. 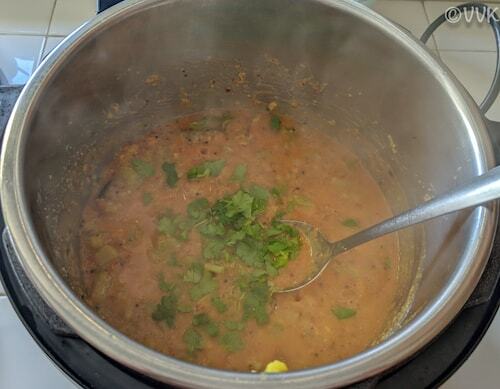 Mash the moong dal roughly. Note: You can cook similarly in the pressure cooker as well with the pressure cooker inserts. 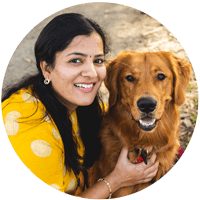 I use my stackable pan both on my Instant Pot and the traditional stove-top pressure cooker. If you are cooking in pressure cooker, then cook for two whistles. Remove the trivet and drain the water from the inner pot of the Instant Pot and set it in the saute mode. When the display shows “HOT,” add the coconut oil and after 30 seconds add the mustard seeds, urad dal, channa dal, hing and curry leaves. 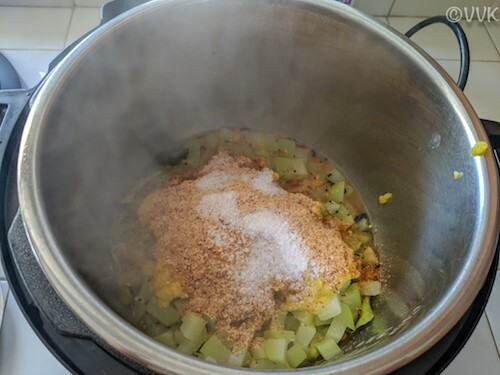 Allow it to splutter and then add the cooked chayote squash along with the water, cooked moong dal, ground kootu powder, and salt. Gently mix it and if required add 1/2 more cup of water. I did not add. Let it cook for three minutes and then add the cilantro. 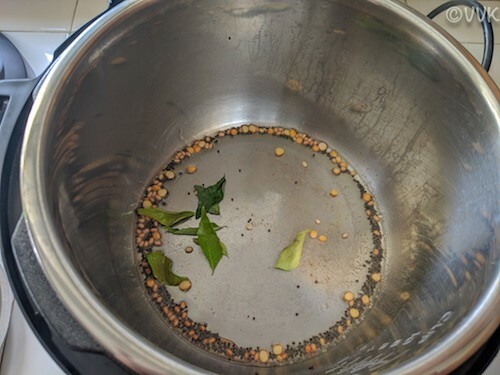 Mix once and turn off the Instant Pot. You can make this kootu on a stove top as well. 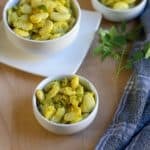 Instead of chayote squash, you can use any vegetables of your preference like bottle gourd, snake gourd, ridge gourd, ash gourd or pumpkin. 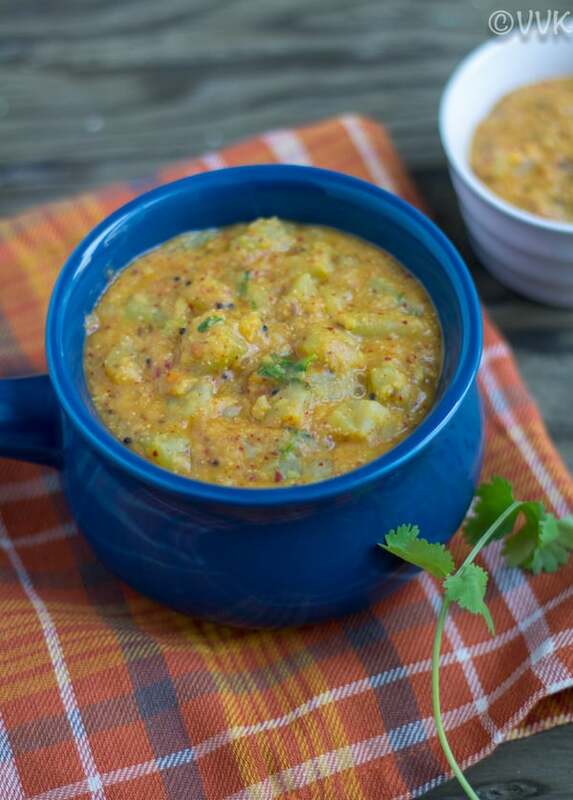 Moong dal and chayote squash gravy prepared with fresh ground cumin and poppy seed masala without any coconut in the Instant Pot. Arrange the stacking pans and close the lid. Mine doesn't have a lid. 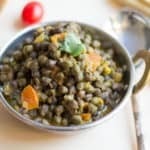 When the display shows "HOT," add the coconut oil and after 30 seconds add the mustard seeds, urad dal, channa dal, hing and curry leaves. Let it cook for three minutes and then add the cilantro. Mix once and turn off the Instant Pot. Wow vidhya, kootu with khasa khasa, looks yumm!! Love rich and creamy it looks! I bet it tastes divine with some hot steaming rice! Thanks :-) It’s my fav too. I also make a lot of recipes PIP in my Instant pot. Love chow chow kootu and this is absolutely my comfort food. 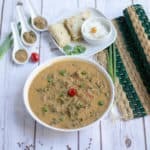 This looks like a super healthy and flavourful gravy and loved the PIP method in instapot.. will love to explore more instant recipes from your blog. That is an interesting spice powder for this kootu. We usually make kootu with lots of fresh grated coconut. This version is quite different and need to try this. Vidhya, I loved the recipe. The addition of poppy seeds and the pottukadalai is a welcome change than the usual coconut based ones. Filling and goes well with chapati or rice. Thanks a lot pa. Learned this from my Mom. That is a flavorful kootu for sure. With poppy seeds I am sure it is very unique. Bookmarked to try later. Sounds like one flavor filled gravy even without coconut addition. Bookmarked to try later. :-) Thanks. I hope you like it. Can smell the flavor of this kootu, especially the grounded spice mix says how flavourful this kootu will be. Inviting kootu definitely.